Welcome to the 7 KIDS Valentine Hop! Are you ready for hearts and flowers? Oh, and don't forget love! Well...hop around and you are gonna see lots of all three! I decided to make a pretty Valentine for my sweet hubby! I stamped some manilla tags with an old text stamp (Hero Art??) first and then cut some flowers with the Tim Holtz Tattered Flower Garden Die Strip. I inked each flower with Picked Raspberry, Worn Lipstick and Tea Dye Distress inks. The flowers were held together with Tim Holtz fasteners. The hearts were cut with one of my new favorite die sets by Spellbinders Media Mixage called Hearts One. I cut the largest heart with some paper from the WildFlower (Carta Bella) and the middle heart with another manilla tag. I stenciled both hearts with Tea Dye Distress ink and the MPD Graduated Diamonds(MFT) stencil. I also cut 3 smaller hearts, inked them and then added some Aged Gold (Stampendous) embossing powder to them to give them some texture. Before putting everything together on the card base, I distressed all the edges of the papers with my Tim Holtz Distress tool. I think this gives the card a nice vintage feel. I hope you will all share your Valentine projects with us! $20 GIFT CERTIFICATE to the 7Kids store!!! Supplies available at the 7Kids Store are listed below! Beautiful Card! your flowers are amazing! I love the worn wood background paper too. Such a great touch. oh my, just beautiful. I love all the die cuts, and tattered flowers. You've really put together a gorgeous arrangement. I bet your hubby is going to LOVE it. I love your papers and how you used them. This card feels mixed media and is so artistic. I love the flowers and hearts, pearls! Very beautiful in colors and your design!! This is absolutely gorgeous!! I love the design and the beautiful flowers!! What a stunning card!! Awe your card is very Beautiful!!! Mackie, your card is absolutely stunning! It is so pristinely designed and artistic (to steal Kelly's perfect word). The flowers are incredible and I love the stenciling. Each accent is in its perfect place, which is far from easy to do. Fantastic work on this heartfelt creation! 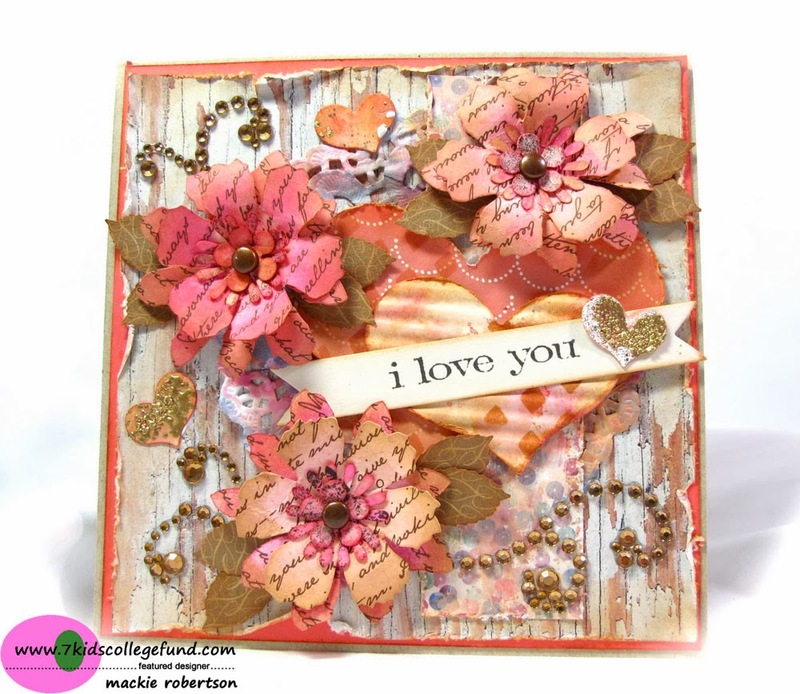 The flowers, the hearts, the tattered background...wow Mackie these all add up to one fabulous card!! Your card is so beautiful. I love it. DH will LOVE this! GORGEOUS text flowers and hearts and the wood BG makes it masculine! LOVE the flourishs, too! Oh wow!!!! Really really gorgeous layers & textures on your card !!! The color scheme and layering is just incredible. Such a talent. Would love to receive something so incredible. So pretty and sweet - I love all the flowers. Wow Mackie!!! This is divine. I so love the flowers and the colors. Wowza Mackie! Love all those gorgeous blossoms and shimmer! This is so stunning! Beautiful card and that flowers looks gorgeous. ..loved that bg . paper. Mackie, your card is stunning! Beautifully put together. I love your style and the colors are fabulous. Mackie!! Wow this is stunning! Oh how I love all those pretty flowers! Awesome card. Really love all the flowers, and that background paper is perfect! Beautiful card! Fabulous details and a lovely color combo! Whoa! Your card is totally cool, love it! So pretty Mackie. Love the weathered wood grain background and those layered flowers. The sponging looks great. So many Beautiful flowers and flourishes! LOVE this card! Earlier I had asked you how you get your paper to look distressed. I just seen in this one you put with your Tim Holtz Distress Took. Yeah! I've gotta look for one of those little puppies and try it. Thanks for showing us your work.